The Mr. Funnel Fuel Filter’s innovative design combines an anti-static polypropylene funnel with it’s own filter. When fuel is poured through the Fuel Filter Funnel, water and debris will not pass through the filter’s fluoropolymer-coated stainless steel filter. 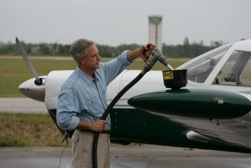 Only filtered fuel flows through to your engine, improving its efficiency, durability, and proper operation. The sump area collects the deflected water and contaminates for easy cleaning and inspection.